The Space Needle is an observation tower in Seattle, Washington, United States. It is a landmark of the Pacific Northwest and an icon of Seattle. It was built in the Seattle Center for the 1962 World's Fair, which drew over 2.3 million visitors. Nearly 20,000 people a day used its elevators during the event. Once the tallest structure west of the Mississippi River, it is 605 ft (184 m) high, 138 ft (42 m) wide, and weighs 9,550 short tons (8,660 tonnes). It is built to withstand winds of up to 200 mph (320 km/h) and earthquakes of up to 9.0 magnitude, as strong as the 1700 Cascadia earthquake. It also has 25 lightning rods. The Space Needle has an observation deck at 520 ft (160 m) and the rotating SkyCity restaurant at 500 ft (150 m). The downtown Seattle skyline, as well as the Olympic and Cascade Mountains, Mount Rainier, Mount Baker, Elliott Bay and surrounding islands can be viewed from the top of the Needle. Visitors can reach the top of the Space Needle by elevators that travel at 10 mph (16 km/h). The trip takes 41 seconds. On windy days, the elevators slow to 5 mph (8.0 km/h). On April 19, 1999, the city's Landmarks Preservation Board designated it a historic landmark. The architecture of the Space Needle is the result of a compromise between the designs of two men, Edward E. Carlson and John Graham, Jr. The two leading ideas for the World Fair involved businessman Edward E. Carlson's sketch of a giant balloon tethered to the ground (see the gently sloping base) and architect John Graham's concept of a flying saucer (see the halo that houses the restaurant and observation deck). Victor Steinbrueck introduced the hourglass profile of the tower. The Space Needle was built to withstand wind speeds of 200 mph (320 km/h), double the requirements in the building code of 1962. The 6.8 Mw  Nisqually earthquake jolted the Needle enough in 2001 for water to slosh out of the toilets in the restrooms. The Space Needle will not sustain serious structural damage during earthquakes of magnitudes below 9.1. Also made to withstand Category 5 hurricane-force winds, the Space Needle sways only 1 in (25 mm) per 10 mph (16 km/h) of wind speed. For decades, the hovering disk of the Space Needle was home to 2 restaurants 500 ft (150 m) above the ground: the Space Needle Restaurant, which was originally named Eye of the Needle, and Emerald Suite. These were closed in 2000 to make way for SkyCity, a larger restaurant that features Pacific Northwest cuisine. It rotates 360 degrees in exactly forty-seven minutes. In 1993, the elevators were replaced with new computerized versions. The new elevators descend at a rate of 10 mph (16 km/h). The proposed Space Needle had no pre-selected site. Since it was not financed by the city, land had to be purchased within the fairgrounds. The investors had been unable to find suitable land and the search for a site was nearly dead when, in 1961, they discovered a plot, 120 by 120 ft (37 by 37 m), containing switching equipment for the fire and police alarm systems. The land sold for $75,000. At this point, only one year remained before the World's Fair would begin. The Needle was privately financed and built by the Pentagram Corporation, consisting of Bagley Wright, contractor Howard S. Wright, architect John Graham, Ned Skinner, and Norton Clapp. 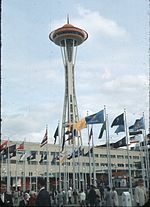 In 1977 Bagley, Skinner and Clapp sold their interest to Howard Wright who now controls it under the name of Space Needle Corporation. With time an issue, the construction team worked around the clock. The domed top, housing the top five levels (including the restaurants and observation deck), was perfectly balanced so that the restaurant could rotate with the help of one tiny electric motor, originally 0.8 kilowatts (1.1 hp), later replaced with a 1.1 kilowatts (1.5 hp) motor. With paint colors named Orbital Olive for the body, Astronaut White for the legs, Re-entry Red for the saucer, and Galaxy Gold for the roof, the Space Needle was finished in less than one year. It was completed in April 1962 at a cost of $4.5 million. The last elevator car was installed the day before the Fair opened on April 21. During the course of the Fair nearly 20,000 people a day rode the elevators to the Observation Deck. The 20,000 mark was never reached, missed by fewer than 50 people one day. Upon completion, the Space Needle was the tallest building in the western United States, replacing the Smith Tower in downtown Seattle as the tallest building west of the Mississippi since 1914. An imitation carillon was installed in the Space Needle, and played several times a day during the World's Fair. 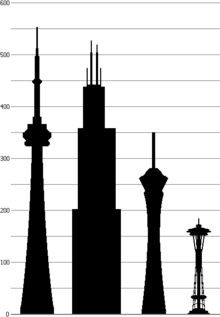 The instrument, built by the Schulmerich Bells Company of Hatfield, Pennsylvania under the name "Carillon Americana," recreated the sounds of 538 bells and was the largest in the world, until eclipsed by a 732 bell instrument at the 1964 New York World's Fair. The operator's console was located in the base of the Space Needle, completely enclosed in glass to allow observation of the musician playing the instrument. It was also capable of being played from a roll, just as a player piano would be. The forty-four stentors (speakers) of the carillon were located underneath the Needle's disc at the 200 foot level, and were audible over the entire fairgrounds and up to ten miles away. The carillon was disassembled after the fair's close. In 1982, the SkyLine level was added at the height of 100 ft (30 m). While this level had been part of the original plans for the Space Needle, it was not built until this time. Today, the SkyLine Banquet Facility can accommodate groups of 20–360 people. 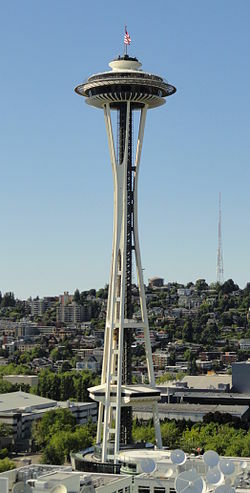 In May 2008, the Space Needle received its first professional cleaning since the opening of the 1962 World's Fair. The monument was pressure washed by Kärcher with water at a pressure of 2,900 psi (20,000 kPa) and a temperature of 194 °F (90 °C). No detergents were used in consideration of the Seattle Center and the EMP building. As part of the celebration of its 50th anniversary, the Needle was painted "Galaxy Gold" in April 2012, the same color used when the needle was originally constructed for the 1962 World's Fair. This temporary makeover, intended to last through the summer, is not the Needle's first: it had the University of Washington (UW) Huskies football team logo painted after the team won the 1992 Rose Bowl, appeared as a giant "Wheel of Fortune" in 1995, was painted crimson after Washington State won the Apple Cup, and has been seen in Seattle SuperSonics colors. A renovation of the top of the Space Needle began in the summer of 2017, to add an all-glass floor to the restaurant, and replace the observation platform windows with unbroken floor-to-ceiling glass panels unobstructed by mullions to more closely match the 1962 original concept sketches, as well as upgrades and updates to the internal systems. Called the Century Project, the work is scheduled to finish by June 2018, at a cost of $100 million in private funds. The designer is Olson Kundig Architects and the general contractor is Hoffman Construction Company. The rotating restaurant's motor will be replaced, the elevator capacity will be increased by adding elevators, or double-stacking them, and the energy efficiency of the building will be improved with the aim of achieving LEED Silver Certification. The temporary scaffold's 28,000-pound (13,000 kg), 44,650-square-foot (4,148 m2) platform under the top structure was assembled on the ground, and then lifted by cables 500 ft (150 m) from the ground to the underside of the structure, controlled by 12 operators standing on the platform as it was raised. The platform is the largest in circumference ever made by Safway Services, a company specializing in unique construction scaffolding. Following the two 1974 suicides, netting under and additional fencing around the observation deck were installed. In spite of the barrier additions, however, another successful suicide occurred on July 5, 1978. In this instance, an unidentified young woman climbed over the netting and leaped to her death from the northeast side of the structure. As a symbol of the Pacific Northwest, the Space Needle has made numerous appearances in films, TV shows and other works of fiction. Examples of films include It Happened at the World's Fair (1962), where it was used as a filming location, and Sleepless in Seattle (1993). In the 1974 film The Parallax View, the inside and outside platforms of the observation deck are the setting for a political assassination and a brief chase takes place on the roof above it. In the 1999 film Austin Powers: The Spy Who Shagged Me, it served as a base of operations for the villain Doctor Evil with the word Starbucks written across its saucer after his henchman Number 2 shifted the organization's resources toward the coffee company. It is also featured prominently in Chronicle (2012), and is a key element in the film's climax. The Space Needle has been used in several practical jokes, especially those on April Fools' Day. In 1989, KING-TV's Almost Live! reported that the Space Needle has collapsed, causing panicked people to call emergency services and forcing the station to apologize afterwards; the incident was compared to the 1938 radio broadcast of The War of the Worlds, which caused nationwide panic. In 2015, public radio station KPLU 88.5 FM reported in the news story "Proposed Development To 'Assimilate' Seattle's Landmark Space Needle?" that a permit application (Notice of Proposed Land Use Action) had been submitted "to construct a 666 unit cube to assimilate" the landmark. ^ "Space Needle". CTBUH Skyscraper Center. ^ a b c d e f g "Space Needle Fun Facts". Space Needle Official Site. August 19, 2015. Retrieved 2015-08-19. ^ "Seattle holds groundbreaking ceremony for the Space Needle on April 17, 1961". HistoryLink.org. Retrieved 2007-01-12. ^ "Photos: Revamping Space Needle is like 'building a ship inside a glass bottle'". The Seattle Times. 2017-11-07. Retrieved 2017-11-12. ^ Treviño, Julissa (2018-05-24). "Seattle's Iconic Space Needle Unveils New Look After $100 Million Renovation". smithsonianmag.com. ^ O'Hare, Maureen (June 25, 2018). "Seattle's Space Needle gets see-through floor". CNN.com. ^ Speidel, Bill. Through the Eye of the Needle. Seattle: Nettle Creek. pp. 6–7. ISBN 0914890042. The final design... was either John Graham's... or Victor Steinbrueck's, who took the trouble of calling me from his deathbed to make sure I didn't credit Graham. ^ "Needle in the sky". Via Magazine. January 2006. ^ "Big beam for Space Needle is protested". Seattle Times. 30 November 1999. ^ Jacobs, Jeff (June 3, 2013). "Seattle Space Needle". Emerald City Journal. Retrieved 2013-12-20. 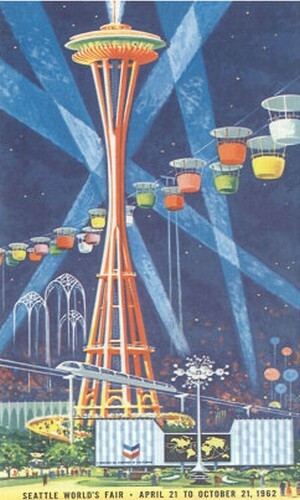 ^ ""Seattle World's Fair" poster". ^ Northwest, Durango (16 July 2010). "Durango Washington: Seattle Space Needle". ^ Emporis GmbH. "Columbia Center". ^ "About the Needle - Space Needle". 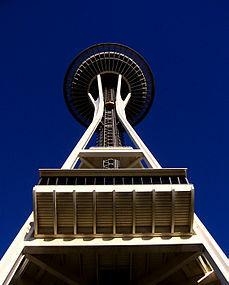 ^ "Space Needle History: Sounds of the Needle". ^ "Century 21 Exposition (1962): Theme Songs and Souvenir Records - HistoryLink.org". ^ rixarcade (15 August 2013). "The Space Needle Carillon - Malaguena" – via YouTube. ^ P-I Staff and News Services (May 19, 2007). "Californian is Needle's 45 millionth visitor". Seattle Post-Intelligencer. Retrieved May 30, 2007. ^ "Cleaning Equipment from Karcher". ^ "Spit and polish for a Seattle icon". KOMO News. May 15, 2008. Retrieved July 21, 2016. ^ Trujillo, Joshua (April 17, 2012). "Space Needle returns to its original color". Seattle Post-Intelligencer. Retrieved August 19, 2015. ^ "Space Needle painted crimson and gray". Washington State University. November 15, 2005. Retrieved August 19, 2015. ^ "Fun Facts - Space Needle". ^ a b c "Woman falls to death from Space Needle". The Sunday Oregonian. Portland, Oregon. Associated Press. May 26, 1974. p. 49. ^ "Seattle Space Needle was site of premature birth". The Oregonian. Portland, Oregon. Associated Press. June 12, 1974. p. 92. ^ "Young Woman Third to Leap From Needle". Nashua Telegraph. Nashua, New Hampshire. United Press International. July 6, 1978. p. 2. Retrieved August 27, 2016. ^ Jeremy Packer (2009). Secret Agents: Popular Icons Beyond James Bond. Peter Lang. p. 65. ISBN 978-0-8204-8669-7. ^ Steve Zimmerman (21 November 2012). Food in the Movies, 2d ed. McFarland. p. 121. ISBN 978-0-7864-5569-0. ^ Kim Fellner (19 June 2008). Wrestling with Starbucks: Conscience, Capital, Cappuccino. Rutgers University Press. p. 2. ISBN 978-0-8135-4506-6. ^ "KING-TV on Space Needle hoax: Sorry, folks". Seattle Post-Intelligencer. April 3, 1989. p. A8. ^ Dougherty, Phil (September 26, 2017). "KING-TV reports Space Needle collapse on April 1, 1989". HistoryLink. Retrieved April 1, 2019. ^ Clutter, Stephen (April 2, 1989). "Too deep a needling?". The Seattle Times. p. B4. ^ McFadden, Kay (2004-05-13). "Condo by condo, Seattle has become a lot like 'Frasier'". The Seattle Times. Retrieved 2010-01-23. ^ Fuchs, Cynthia. "Dark Angel". PopMatters. Retrieved June 23, 2015. ^ "Lego Architecture: Seattle Space Needle". Lego Architecture. ^ Hohenadel, Kristin (December 31, 2013). "A New Eiffel Tower Building Set for Paris-Loving Lego Fanatics". Slate. Retrieved October 22, 2017. Knute Berger (2012). Space Needle: The Spirit of Seattle. Documentary Media. ISBN 978-1933245263. 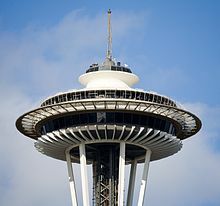 Wikimedia Commons has media related to Space Needle. Entry at site of Howard S. Wright Construction Co.